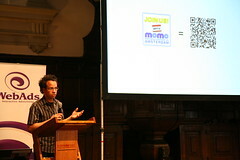 Mobile Monday Amsterdam turns 1 next MoMo and to celebrate this we have some top notch speakers on Mobile Marketing. We are still waiting for some more top speakers to confirm. Check the website for the latest details. Links with more information about the speakers are provided below. Use Mobile Event Center (m.mobilemonday.nl/center) to make sure your name, function and company are printed correct on your name badge. Do you feel a little lost doing so or is it your first time you use Center? Follow this an easy instruction for using Center. Do you want to join us on the 2nd of June? You can now RSVP for this event. Remember: entrance is free, but limited seats available as usual, so don’t delay – RSVP now!